Law, Culture, and Economic Development brings together some of the leading legal scholars, policymakers and practitioners in the international economic development area (with the emphasis on Latin America) to address key issues of legal reform facing developing countries in their effort to achieve accessible, equitable and sustainable economic development: issues of cultural impediments will be stressed. With a preface by Professor Sir Elihu Lauterpacht, QC, CBE, some of the contributing experts include Roberto Danino (former General Counsel of the World Bank), Hernando Desoto (author of the Mystery of Capital), Professor Roberto MacLean (former Head of Judicial Reform at the World Bank), Professor Antonio Parra ( former Deputy-Secretary of ICSID), Dr Teresa Genta-Fons (World Bank Senior Legal Counsel), Professor Bernhard Grossfeld, Professor Jeswald Salacuse, Professor Julio Faundez, Professor Mads Andenas, Professor Beverly Carl, Professor Joseph Norton, Professor Ndiva Kofele Kale, Professor Christopher Hanna, Professor Shubha Ghosh, Professor Diego Bunge, Professor Marcos Valadao, Dr Anna MacLean, and Dr Mauricio Bacquero-Herrara. Topics considered from a developmental perspective include human rights, legal institutions, judicial reform, investment treaties, investment disputes, corruption, financial sector reform, accounting systems, linkage to the WTO, administrative legality, intellectual property, corruption, taxation and legal education reform. 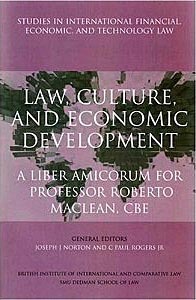 The chapters are derived from presentations made at the 2006 Paul Carrington Memorial Lecture at the SMU Dedman School of Law in Dallas, Texas, honouring the distinguished career (as Law Dean, Judge, Central Banker, Ambassador, legal scholar, and judicial reform expert) and 75th birthday of the Hon Roberto MacLean. You must be logged in before you can purchase this publication. "Law, Culture and Economic Development"